First there was Dropcam Pro then Nest purchased Dropcam but that was after Google purchased Nest. Bottom line, all these cameras are made by the same company. I own several Dropcam Pros as well as a few Nest Cams and they are great cameras. I can’t quite bring myself to pay for cloud storage but the setup is super easy and can be done by using the iPhone application. It pokes a secure hole in your network to allow access from anywhere. I use them for security purposes when I’m not home. The cameras have motion sensors and I’m aware of movements in front of the cameras when they occur. Update: Since originally writing this article, Nest finally introduced an outdoor camera. So consider the Nest Cam Outdoor if you want to buy a new camera for outdoor use. It’s one of the best outdoor cameras on the market. It uses the same app as the other DropCam and Nest Cam models and it’s weatherproof. This article will discuss options for using the DropCam or Nest Cam Indoor models to see outdoors. The cameras have great night vision capabilities. Unfortunately though, you will be watching your videos with the camera indoors but looking out the window. It’s still not a bad photo, but you will find the infrared sensors work against the camera as the reflection shines in the window so you will need to turn that feature off. You will also find the status light also gets in the way so you will need to turn that off too. Lastly, be sure to get the camera as close as you can to the window pane. Preferably right against the glass. Now we need to look at ways to get the DropCam or Nest Cam as close as possible to the window glass. If you cannot get the Nest Cam very close to the glass, consider the ElHook Stick-On Nest Cam Security Video Wall Mount. 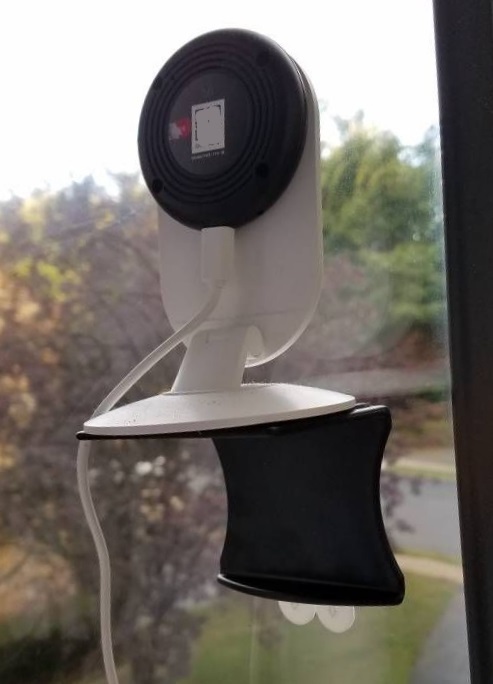 It’s a handy way to perch a Nest Cam onto a window. This is a clever mount that uses temporary adhesive strips to attach the shelf against the window. Your Nest Cam sits atop the ElHook Mount just like it would on your shelf or counter. If you would prefer not to use the ElHook, there are mounting accessories such as the Wasserstein Twist Mount for Nest Cam Indoor. The product consists of a flexible rubber gooseneck stem and silicone cover for the Nest Cam Indoor. This is handy for wrapping around a curtain rod. Your camera will be seated upside down but not to worry, just go into the Nest app and let it know you need to invert the image. Nice idea. Some of these mounts may present a power challenge. The shorter USB cable that nest provides is somewhat limited in length. I often find that the 20 Foot USB Cable for Nest Cam is long enough for almost any application. It’s the same color and adapter type as the one that Nest provides in the box. No need to purchase a new A/C adapter as this cable is going to use the one that Nest provides in the box. Be sure to check out our article on Nest Cam and DropCam Mounts for Home Security. There’s some nice ideas in this article for using your camera in different places within your home.